Jimmy Stewart was born in Indiana, Pennsylvania on May 20, 1908. 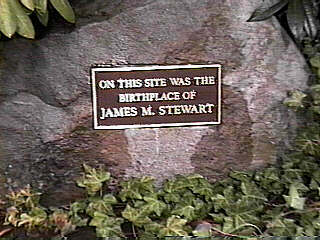 The front steps to the Stewart home, which no longer stands, remain along Philadelphia Street and are topped by this plaque. The steps on Philadelphia Street. Statue of Jimmy Stewart, Indiana, PA.
Indiana's alter ego--Bedford Falls, from the film, It's a Wonderful Life. We visited Indiana for the film's fiftieth anniversary celebration in December, 1996. Jimmy Stewart Movies on VHS Video Tape--Dozens of Titles!